It's not every day that you're invited to dine at as magnificent a restaurant as the Bombay Brasserie (map) in the elegant 5-star Taj Hotel. We've heard so much about the Taj that we were super-excited to finally have the opportunity to see what all the fuss was about. Stepping into the building, I felt a sense of history coupled with modern style and opulence. 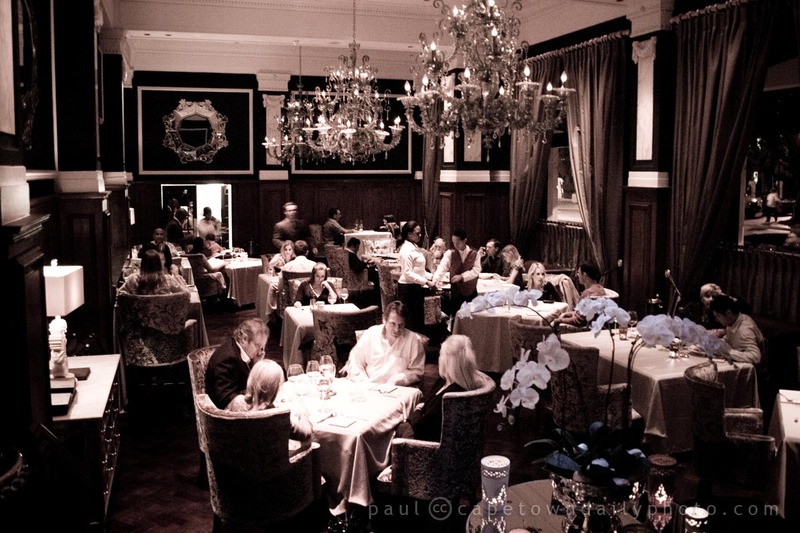 Bombay Brasserie, shown in this photo, was spectacular, and the photo doesn't by any means do it justice. The light was soft and intimate and the furniture and décor looked like it had come right out of a rich estate in colonial India. The quiet music and super-comfy chairs and seemed to encourage us to enjoy a long evening of dinner and conversation. It was brilliant. The waiters were simply impeccable, and even though the Taj is "only a 5-star hotel" the staff made it feel like Bombay Brasserie deserved a sixth. It was really the most attentive, yet not overbearing, service that we've ever had. Now, I've said so much about everything else, but of course the real reason for visiting such a top restaurant is... the food. In a word, it was "WOW". I think Bombay Brasserie may well be the best Indian restaurant in Cape Town. While the food isn't cheap, it's not outrageously expensive either considering the quality, and the opulence of the experience. I guess you could expect to pay around R300 - 400 per person for a very filling three-course meal with drinks (assuming of course that you're not much into expensive wine or whiskey :) ). I've saved another photo and a few more details for a follow-up post, so come and check back tomorrow! Posted in General and tagged hotel, restaurant on Friday, 30 April, 2010 by Paul. sounds good, think im going to give it a try…! Looking forward to seeing the Bombay Brasserie’s true colors. Iain, Bev, I think you’ll love it. Lunachance, I thought of getting into the food, but started running out of time, space, and creativity. (I wrote the article at 1am, after a gruelling 14 hour day at the office and a more gruelling 2 hour fight with some silly trojan/virus! :( ) If I don’t get to the food in the next article, I’ll leave a comment here.